Citrix Systems is a multinational American company that provides server and desktop virtualization, networking and software (Wikipedia). The University of tromsø use Citrix to virtualize applications that require extra security. 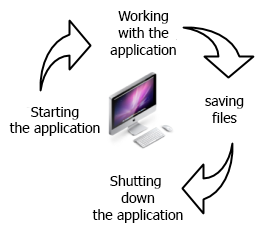 This is applications like Agresso, Paga, FS, Syllabus, remote desktop etc. To access the Citrix Applications, the first thing you must do is to install Citrix Receiver on your computer. Follow the instructions in the manuals below. When you start a program on your computer, everything you do takes place on that spesific computer. For example: If you start Microsoft Excell on your PC, All the work related to opening the program, Working out calculations, saving the files etc. is done locally by your computer. When you use an application that is installed on a Citrix server, the server (not your PC) does all the work tasks related to that program. You are basicly remote controlling the program from your computer.